Actvity Summary: This poster shows several different images of microfossils, taken through microscopes. Microfossils are microscopic single-celled organisms that belong to the Kingdom Protista (or Protoctista). Examples include calcareous nannofossils, foraminifera, diatoms, radiolarians, and silicoflagellates; planktonic organisms that inhabit the sunlit surface waters of the world ocean. The tiny shells of microfossils are the sediments that cover vast areas of the seafloor. This poster shows several different images of microfossils, taken through microscopes. The microfossils were found in cores recovered by the scientific ocean drilling vessel, JOIDES Resolution. When a core is brought up on deck, scientists look at these slides to identify the microfossils found in cores and determine the age of the sediment, as well as something about Earth’s past climate. 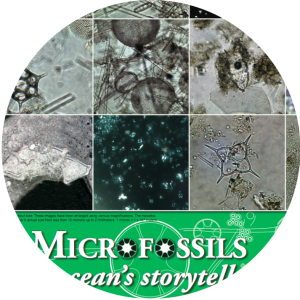 The activities on the back of the Microfossils poster simulate the identification and use of these microfossils to examine past climate change and Earth history.